One of the biggest benefits of the Android operating system is customization. From homescreen widgets to wallpapers, it's extremely easy to make the phone look and behave exactly how you prefer. A very easy way to do this is by using one of the dozens of homescreen replacements available on the Market. Some, like Helix or Home++ have been around for a while, but a relative newcomer is LauncherPro. All Android users should give this one a try. It's free, extremely fast, and brings a wealth of features without drastically changing the look and feel. 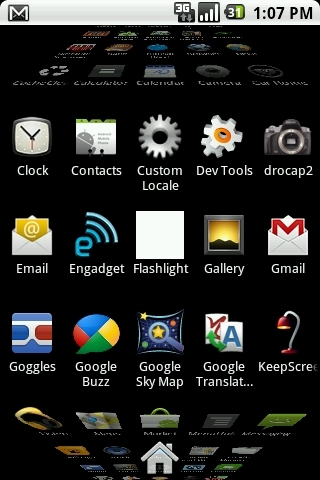 Even on the dated G1, it's very fast (definitely faster than the stock launcher). It provides a zooming effect on the app drawer, as well as 3D app scrolling, elastic bounce when swiping, etc. You can even set four custom shortcut icons to appear at the bottom of the screen next to the app drawer button. These shortcuts can display the original app icon, a custom glassy LauncherPro icon, or any other image file you chose. Very customizable. The 3D app drawer is by far my favorite feature. It's super smooth, even on the G1, and really adds a nice amount of polish to the system. The excellent developer has stated on the forums that dozens of extra features are in the works. The app is frequently updated to add new feature requests, too. I highly recommend anyone with an Android device check it out. LauncherPro is free and currently available for Android 2.0 and up (which means that it's only compatible with rooted G1s). You can find it in the Market by clicking here from your phone, or by scanning the QR code here.